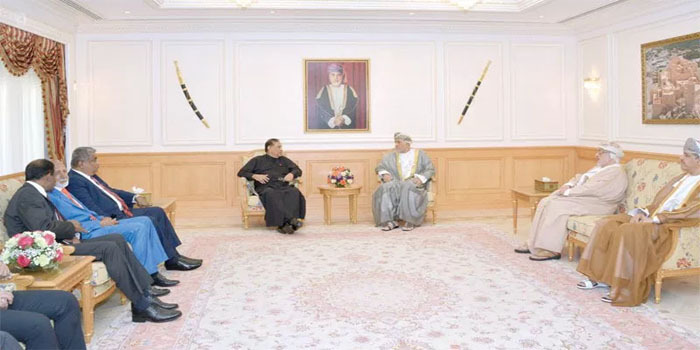 On behalf of His Majesty Sultan Qaboos, His Highness Sayyid Shihab bin Tareq al Said received in his office on Monday Karu Jayasuriya, Speaker of Sri Lankan Parliament, and his delegation. The meeting was attended by Dr Yahya bin Mahfoudh al Mantheri, Chairman of the State Council, and others. Meanwhile, Dr Al Mantheri and Shaikh Khalid bin Hilal al Maawali, Majlis Ash’shura Chairman, also separately received Jayasuriya and his delegation in their offices. The meeting reviewed means of enhancing bilateral cooperation in various fields.